Sea anemones are essentially half plant, half animal. Two new studies have revealed that the humble anemone is capable of complex gene regulation seen in animals, but is also genetically closer to a plant than it is to any vertebrates. Gene regulation is one of the most important factors in defining the appearance, shape and function of all animals. Genome sequencing has now shown that sea anemones display an intricate and complex genetic repertoire, just like higher-model organisms. This suggests that morphological complexity does not come from the presence or absence of individual genes, but rather how they are linked together. The discovery of such complex genetic functions within the sea anemone has wound back the evolutionary clock. 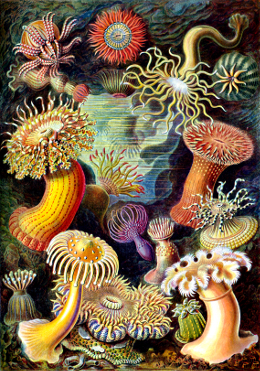 “Since the sea anemone shows a complex landscape of gene regulatory elements similar to the fruit fly or other model animals, we believe that this principle of complex gene regulation was already present in the common ancestor of human, fly and sea anemone some 600 million years ago,” says researcher Michaela Schwaige, from the University of Vienna’s Department for Molecular Evolution and Development. However, gene regulation largely controls the basic formation of an organism, whereas many more specific elements come later, in the transcriptional process of microRNA. MicroRNAs are found in both plants and animals, but are thought to have evolved separately in each as they operate in distinctly different ways. Intriguingly, the 87 microRNAs identified in the sea anemone have all the hallmarks of plant microRNA. The existence of elements from two distinct worlds of biology suggest the sea anemone came from an ancient evolutionary link between plants and animals. While the sea anemone's genome, gene repertoire and gene regulation on the DNA level is surprisingly similar to vertebrates, its post-transcriptional regulation is plant-like and probably dates back to a common ancestor of animals and plants. The report on the microRNA findings is accessible here. The report on the anenome’s gene regulation is accessible here.